A first class swebite that brought the memories back for me. The Techical & Optical Equipment shop in High Holborn, London was a centre for Soviet equipment of all types, from the Astrad Solar and later Vega Selena radios to microscopes, telescopes and cameras. I own a range of Russian/Soviet optical equipment, including telescopes, binoculars, a monocular and a Fed camera... and a Polyot watch is on my wrist at the moment. 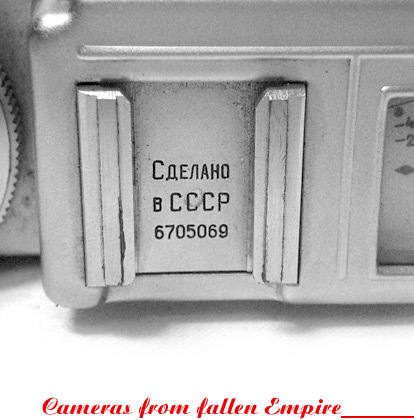 Excellent site, useful information regarding the Russian cameras and what a helpful person, Aidas! Thank you very much for the info and the quick replies! Real beautiful site. I love that it built in very systematic manner and designed with good taste. It helps me to determine when my Zorki-4 was produced, and also I got a lot of interesting info about other russian camearas Большое спасибо за создание этого проекта! My Zorki "C" Type 2b has the serial No. 56007687, so is older than the one you quote as found on Ebay. Hope this is of interest to you. B. Rowe. THANKS, THIS SITE HELPED ME FIND OUT WHAT MY CAMERA IS I JUST PURCHASED. ITS A 11th VERSION TTL ZENIT N*82141529 NOT SURE WHAT THE N MEANS THOUGH. AGAIN THANKYOU MUCH. Hi, it's a great site you have here. I'm working on a advertising agency and a lomo lover. I don't have the money To buy a original Lomo LCA, so a both a china LCA. I'm sorry, hehe. Great job. congratulations. great website, excellent work!! I have 2 Soviet era cameras thanks to a friend in the Czech Republic, the first was self explanatory, the second I was lost on till I found your website. Thank You!! Indeed your site is very interesting for research & dating of model's variations. Among my collection of (approx.) a hundred cameras, I own a single russian: a Zorki-3 with engraved #5504305. Camera which I have bought on auction from a deceased gent. Seems to mix-up features of PM1285. Arrow for positioning of its image-counter. No markings on its top plate. Excellent site with lots of useful information. Thanks for sharing.